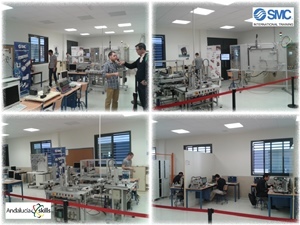 SMC International Training is glad to congratulate the winners of the Regional Vocational Training (VET) Championship of Andalucía (Spain), in Industrial Control profile. In this profile competition, the SMC International Training didactic equipment MAP-207 was used. If you want to know more about this training equipment enter in our MAP-207 - Handling device for parts classification webpage. If you want to know more about SMC International Training events, please, enter in our agenda.